I have two areas of research interest: 1.) the chemistry of gold phosphine complexes similar in structure to drugs used to treat rheumatoid arthritis, and 2.) the different chemical environments in two groups of Vermont ponds, and the effects of the organisms in each site. Gold Research: Gold chemistry elicits visions of alchemists with bubbling flasks in fantastic colors. Sometimes I feel like that except that I take gold and transform it into complexes that might be green, might glow orange under ultraviolet light, or might be dull white. So I might be an anti-alchemist. Gold, besides having an interesting history as the original noble metal, the symbol of wealth and power, is very unique as an element. Its properties, resistance to oxidation, malleability, conductivity, are ultimately related to the arrangement of the electrons in the atom. But gold, being a "heavy metal" is affected also by relativity related to the speed of the electrons around the nucleus. This phenomenon has been used to explain the density of gold, as well as the electronegativity and the color. One goal is to learn more about the basic chemistry of gold and its varied and increasingly complex structures. These compounds exhibit interesting photochemical behavior: they isomerize from cis to trans when they are exposed to light. We want to know how changing the "X" ligand affects the isomerization and if gold-gold interactions in these compounds is involved in this chemical phenomenon. We particularly want to know if we can prove that there are these interactions in solution and if they can be used for self assembly applications. 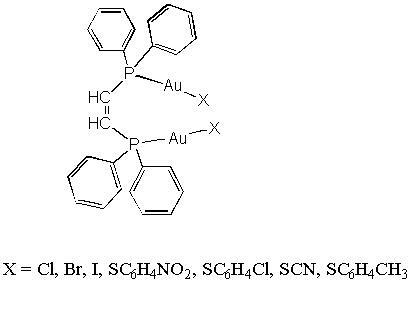 Some of these gold compounds have phosphine-gold-thiol structures that are similar to the gold arthritis drug, Auranofin. In addition some of the dinuclear gold compounds have shown some anticancer properties. It is not known why gold drugs are effective but ligand substitution is often crucial. of bonding around these metals might play a role. We are looking at the ligand substitution and electrochemical properties of these compounds. We are interested in exploring the chemistry of these compounds in order to better understand the next generation of heavy metal drugs as well as gain insight into the mechanism of physiological interaction. As part of our project we are looking at the antimicrobial effects of these gold compounds. Bennington sits in a valley between the Taconic Mountains which are limestone and the Green Mountains which are basically granite. This is one factor that gives rise to an interesting phenomenon: ponds within a few miles of each other have drastically different pH. Ponds with granite base are especially sensitive to acid rain because of limited buffer capacity, while limestone based ponds can counteract acid precipitation. Are there other chemical differences? Do these differences affect the organisms? Working with biologist Betsy Sherman, I am interested in examining the different chemistries in two sets of ponds, one high pH (8) and one lower pH (4.6) and relating this to possible differences in the organisms, particularly red spotted newts. Amphibians are good indicators of environmental effects particularly these newts because they have four distinct stages in their development including a terrestrial eft stage lasting anywhere from 2 - 4 years. We are interested in determining if there are differences in these two groups of newts and if there are do those differences come from evolutionary adaptations or stress caused by different chemical climate in each pond. Equilibria in ponds are sometimes delicate and respond to subtle changes in pond chemistry. The availability of certain chemicals, particulary metals, can be directly affected by pH and can have deleterious (or salubrious) effects on organism development. We will monitor, using a Dionex 120 Ion Chromatograph, the cation and anion profile in the ponds as well as pH, conductivity, and osmotic concentration. Experiments will be done in the lab with egg hatching in different conditions. We will also examine phenotypic differences in the newts from each sample pond and set up systems which allow us to isolate relevant variables and monitor their effect on the newts.We involve students in this work whenever possible (see course description of A Research Case Study: The Chemistry and Biology of Vermont Ponds (with B. Sherman).